Welcome our newest employee… Charli Hendrickson! Charli has been helping at the store in various capacities for many years. As of May 1, she is working full time for us. 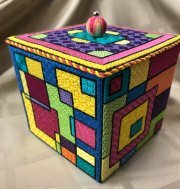 Charli is an accomplished needle artist in many genres: needlepoint, cross stitch, traditional embroidery, hardanger, temari, beading, crewel, and much more. She has been stitching since her grandmother put a needle in her hand when she was three years old. She loves sharing her knowledge with others. Our project this summer was inspired by the Geometric Box Series, stitched by Nancy Yeldell. Every area on each of the five canvases is worked with a unique stitch. The only duplication is the lines that separate the areas. The intent of the project is to use the threads that you have left over from other projects. Repurpose some of your stash! We had our first meeting on June 30th, but you can still join us! The five canvases and the stitch guide are only $65. We meet again on July 28th and August 25th; you can come in during any of our open stitching times to get caught up. 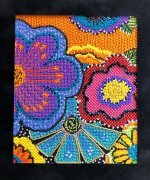 On August 18, 2018 Jill Rigoli of Danji Designs will teach multiple beading techniques in this class featuring a beautiful Laurel Burch canvas Floral Fun. Non-refundable deposit of $100 is due by July 25, 2018. Total cost of the class is $280 and includes the canvas, beads, threads, instruction, and lunch. Class will be held from 10 AM to 4 PM. Please call us at 480.990.2270 to sign up. On Friday, October 5, 2018, we'll gather in Tucson, Arizona for a weekend retreat ~ our very own Stitching Escape. The fee for our Fall Retreat includes hotel room for 2 nights based on double occupancy and meals throughout the weekend. Single occupancy is available at an additional charge. We'll have 24-hour private access to our Stitching Room, the Ironwood Ballroom. The cost for our Retreat is $525.00 based on double occupancy. The cost for a single room is $705.00. This includes two nights, Friday and Saturday, at the OMNI Tucson National Forest in well-appointed rooms. Meals included are Friday dinner, Saturday lunch and dinner and Sunday lunch. Canvas Embellishment with Jill is an additional cost of $135.00. For canvases not purchased at Old Town Needlework an additional charge of $30.00 will be due. · To secure your reservation, a deposit of $200.00 is due by July 15, 2018. · To participate with Jill in Canvas Enhancement your canvas must be received by July 15, 2018. · Payment in full for the Retreat and for Jill's Class is due no later than September 1, 2018. Janice Doxey will be teaching a Whimsy & Grace painted canvas ornament from 10 AM to 4 PM. More details to follow… watch your inbox!